In her excellent book – ‘The Enlightened Mr. Parkinson: The Pioneering Life of a Forgotten English Surgeon’ (Icon Books Ltd) – Dr Cherry Lewis wrote that the earliest reference to Mr James Parkinson’s ‘An Essay on the Shaking Palsy’ was an advert placed in the Morning Chronicle of Saturday 31st May (1817), under a list of books “published this day”. Given this information, we searched the Britishnewspaperarchive online and captured the image presented above. Today is the 200th anniversary of the publication of ‘An Essay on the Shaking Palsy’. In this post, we continue our four part series on the man behind the disease by discussing the ‘Essay’ on the 200th anniversary of its publication. A few weeks before the opening of the Waterloo Bridge, James Parkinson published the booklet that would go on to immortalise him in the annals of medicine. An Essay on the Shaking Palsy, which spans 66 pages, was published by Sherwood, Neely and Jones of London, and printed by Whittingham and Rowland in 1817. At the date of printing it sold for 3 shillings (approx. £9 or US$12). Much has been written about the essay, and we here at the SoPD feel that we have little to actually add to the conversation. Thus our post today will simply provide an overview of the book (a highlights package, if you will), summarising it for those who do not have time to read its entirety (a full copy of the essay can be found by clicking here). In the preface of the book, James gave his reasons for actually writing it. Basically, he wanted to make others aware of what he considered a previously un-described condition. At the end of the preface, James hopes that “friends to humanity and medical science…might be excited to extend their researches to this malady”. And in that situation James would “think himself fully rewarded by having excited the attention of those, who may point out the most appropriate means of relieving a tedious and most distressing malady”. He then moves on to provide a breakdown of the features that make up this condition, which includes a history of tremor that takes into account the works of Aelius “Galen” Galenus, Sylvius de la Boë, and Johann Juncker. And please remember, James was describing this condition for the first time based only on his own observations of just six individuals (three from a distance). His attention to detail was amazing, taking into account so many different aspects of the condition (from the obvious motor features to issues with bowel movements). And he noted it all down in the essay. After describing the basic clinical appearance of the condition, James then immediately moves on to each of the six cases he based his description on. The “next case” (as James wrote it, indicating that the cases are presented in chronological order), Case II, was a man that James casually met with in the street. Case VI may have been the individual that spurred James to write his essay as it was one “which presented itself to observation since those above-mentioned,”. Thus, James had the benefit of hindsight and all the information that he had gained from the previous cases, when he was confronted with Case VI and he could make a thorough study of the individual. In case VI, James also hints at the indiscriminate nature of the condition, afflicting people from all sorts of backgrounds. Having finished reading Chapter 1, it is truly remarkable to recall that James was describing what he thought was a previously unrecognised condition. Remarkable because of the depth and scope he provides. It is difficult to put oneself in his shoes, given that we are now so familiar with the disease. But it does Mr Parkinson great credit both as a surgeon and a writer that what he is describing feels so familiar. 1. Involuntary tremulous motion, with lessened voluntary muscular power, in parts, not in action, and even supported. In this first section, James breaks down the different types of tremor in an effort to better understand this condition he is describing. And again, James cites the works of Galen and Sylvius de la Boë. 2. A propensity to bend the trunk forwards, and to pass from a walking to a running pace. Here James discusses the works of François Boissier de Sauvages de Lacroix (1706 – 1767), a French physician and botanist who is credited with establishing a methodical nosology for diseases (a classification system). It is a demonstration of Mr Parkinson’s studious nature and high general level of intelligence that he was so familiar with the works of de Sauvage – it is a simple task for us modern folk to simply ‘google’ anything we don’t know or are curious about. Where did James go to find his background research for his Esssay? Having clearly outlined the features of the condition, James next moves to Chapter 3 where he attempts to differentiate this condition from other maladies. James did not want to have this new condition he was describing confused with other diseases, hence the meticulous description of the symptoms/features. And it was this feature for James that could be used to distinguish it from other conditions. In this case, the man had been treated with mercury for a venereal infection (click here to read more about early mercury treatments) many years before, which had left him with convulsive movements restricted to the legs. Using this case study approach, however, James proposes that the disease is targeting or affecting an area of the brain stem called the medulla oblongata (which is affected in Parkinson’s disease, and is actually not too far from the midbrain where the significant loss of the dopamine neurons gives rise to the motor features of Parkinson’s disease). Exactly 200 years on, I think it is fair to say that James was a bit too optimistic in nature, but we are certainly a lot closer now to stopping the disease than he was then. James was instructive in how he thought it was best to attack the condition. He divides the condition into two halves, early and late, based on the spread of the motor features from individual limbs to other areas of the body. And he is rather certain that early diagnosis was essential if there was to be any chance of cure. This is very insightful of James. He understood that it was not the weakness felt in the muscles that was paramount in this condition, but rather a dysfunction in the brain. “To such researches the healing art is already much indebted for the enlargement of its powers of lessening the evils of suffering humanity. Little is the public aware of the obligations it owes to those who, led by professional ardour, and the dictates of duty, have devoted themselves to these pursuits, under circumstances most unpleasant and forbidding. Every person of consideration and feeling, may judge of the advantages yielded by the philanthropic exertions of a Howard; but how few can estimate the benefits bestowed on mankind, by the labours of a Morgagni, Hunter, or Baillie. Although, “a Howard” is also an old slang term used to describe a man (any man) of great character! Giovanni Battista Morgagni (1682 – 1771) was an Italian anatomist, who is generally regarded as the father of modern anatomical pathology. 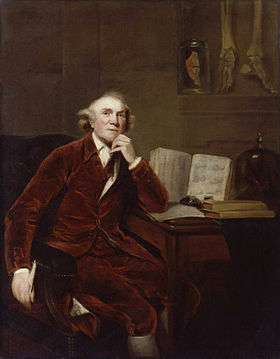 John Hunter (1728 – 1793) was a Scottish surgeon – one of the most distinguished scientists/surgeons of his day. He was an early advocate of careful observation and scientific method in medicine, and James personally learned a great deal from him. Between October 1785 and April 1786, James attended the evening lectures provided by Hunter. James wrote down the lectures verbatim (in shorthand) and his notes were later published by his son John (“Hunterian Reminiscences, Being The Substance Of A Course Of Lectures On The Principles And Practice Of Surgery Delivered By John Hunter In The Year 1785″ – a precious resource given that Hunter’s own notes were later destroyed by fire). Matthew Baillie was another Scottish physician and pathologist. A pupil of his uncle, John Hunter (above), Ballie provided us with the first systematic study of pathology. James was certainly familiar with Ballie, as he cited his works. For further reading on An Essay on the Shaking Palsy we recommend a review written by Prof Brian Hurwitz (King’s College London) called Urban Observation and Sentiment in James Parkinson’s Essay on the Shaking Palsy (1817) which provides fantastic insight into James, the age he lived in, the essay itself, and the reception of the essay (Click here to read that review). This post was written in observation of the 200 year anniversary of the publishing of the Essay on the Shaking Palsy. It is part two in a four part series on the life of Mr James Parkinson (click here for part one). In the third instalment, we will look at his life’s work, before the fourth part looks at his final years and his legacy.